Get IP Address, What is my IP address? Get IP Address / What is my IP Address? Use this get IP address tool to lookup the IP address of your Internet connection. If your surveillance DVR or IP camera is connected to the same router as the computer you are using right now, the above IP address is the public IP address (WAN) that you will use to access your DVR or IP cameras remotely over the Internet. Here are some frequently asked questions that we receive at CCTV Camera Pros related to IP addresses. An IP address is a numerical label assigned to any device that is connected to a computer network with a router. This label essentially acts as a contact number in which a network device can be reached by other network devices. It tells where data is to be sent and where the data is to be received from when communicating with a network device. What is the difference between a WAN and LAN IP address? WAN stands for wide area network. It is another term used to describe the Internet. Cable and DSL modems are assigned IP addresses by the Internet provider that supplies them. These IP address are WAN IP addresses. LAN stands for local area network. These IP addresses are typically assigned by a network router. LAN IP addresses typically start with 192 or 10. When communicating with a network device using it's assigned LAN IP address, the other device must also be on the same network. Now that I know my IP address of my DVR or IP camera, how do I access it remotely? In order to access your security cameras remotely (or any type of network device besides cameras), you typically need to setup port forwarding on your router. This article describes how to setup remote security camera access for iDVR-PRO DVRs using iPhone and Android apps. 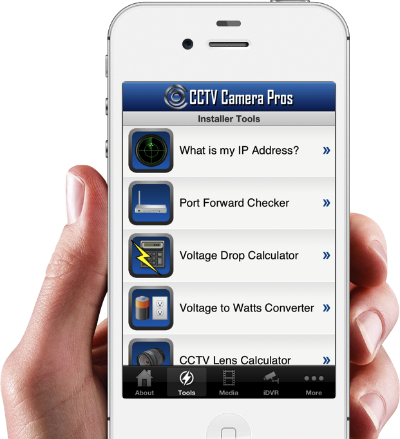 CCTV Camera Pros now has our installer tools available in our mobile apps for iPhone, iPad, and Android devices. This includes the what is my ip address tool. Please download our FREE mobile apps in the Apple App Store and Google Play Store using the below links. Please visit this page to use additional CCTV installer tools and calculators that we have developed. This article was written by Mike Haldas, co-founder and managing partner of CCTV Camera Pros. If you have any questions, you can contact Mike at info@cctvcamerapros.net.